Since Omega started making in-house movements (again), you could say that they stepped up a bit on the horological ladder. Their Hour Vision is a very interesting watch, not only because the caliber 8500 movement, but also because of the classic case design that resembles their 1960s models. Furthermore, their Hour Vision has this nice sapphire centre part in the watch case, enabling you to look at the movement when wearing the watch. I just noticed that there is one for sale via one of the Dutch watch forums (DeZinVanLuxe) and Chrono24 for just over 2500 euro. The sellers asks more through Chrono24, but that gives you some room to bargain, I guess. Perhaps because the local (Dutch) forum seems to be less of a hassle and people seem to ‘know’ each other there. 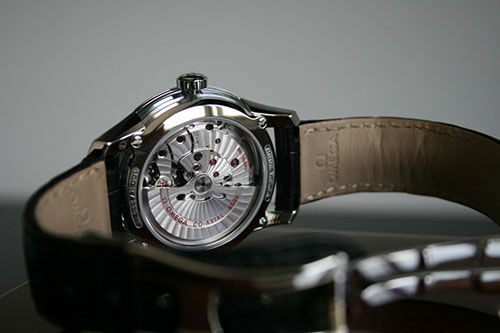 An incredible price for an Omega DeVille Hour Vision with such a cool movement. 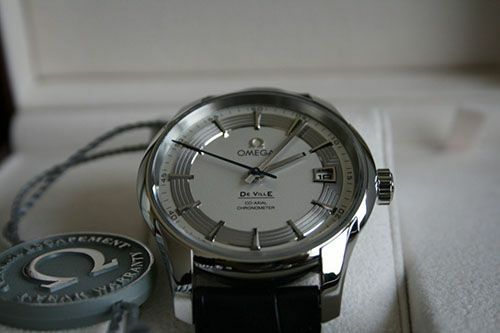 Omega introduced the same movement in other models as well and is slowly starting to get rid of the ETA2892-A2 movements. Not that these movements aren’t up to the task or unworthy, but just because Omega wants to be a true competitor for brands like Rolex. This 41mm diameter wrist watch with co-axial in-house movement is a new classic that does look good in anyone’s collection of time pieces.